Music Theatre International has partnered with world-renowned design and production specialists, Broadway Media Distribution, to offer stunning, first-rate, animated artwork at affordable prices. 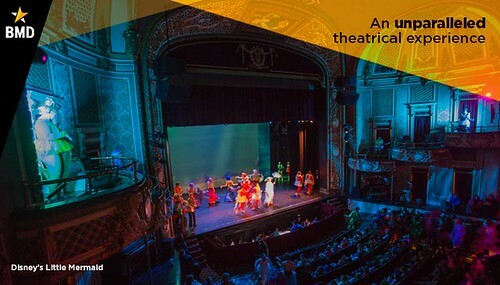 Scenic Projection Show Packages bring a cinematic element to the theatrical medium, solving many problems theaters face when mounting live productions. Scenic Projection Show Packages include all scenes and settings from the official script, which are placed in a playback timeline, allowing operators to press one button to control all of the digital scenery. For specific pricing quotes, order through your MyMTI Account. When you purchase a Scenic Projection Show Package from MTI, a knowledgeable BMD specialist comes alongside as a member of your production team, ensuring customer satisfaction. The BMD team will work with you to ensure that you are completely satisfied with the products and services, that all of your questions are answered, and to be available to help through around-the-clock technical support, if an issue arises. Please contact BMD at 1 (800) 277-0343 / info@bwymedia.com for a free consultation. Note that you will need to accept additional terms and conditions prior to using this product. You may review those here. What if we need to cancel our order? The customer may request a cancellation and receive a full refund up to and until the shipment of the product. Once the product has shipped, no refund or cancellation will be accepted. Absolutely! Just ask us how. Contact BMD directly, by calling (800) 277-0343. What if my theater does not have a projector? To learn more about this and other technical questions, the best option is to contact BMD directly, by calling (800) 277-0343. BMD offers a wide variety of purchase and rental services for projectors. How do the projections work? Depending on your production requirements, you must first select the option of Still Images or Animated Images. All projections are created for specific dates and are delivered premade, ready for customization of time and cue order. A projector is required to display the content. To control and cue all of the projected content, BMD provides a multitude of playback options, from one-click to more advanced customization. Why use Scenic Projection Show Packages? Projections bring life and realism to scenic design and add dynamic cinematic energy to productions. Projections are cost effective compared to traditional costly backdrop rentals. Projections also provide a solution for theatres without a flyspace or organizations that lack a permanent venue. Projection design is a design discipline that is recognized industry-wide and is the future of theatrical storytelling. What are Scenic Projection Show Packages? Scenic Projection Show Packages are still image or animated video projections that coincide with a musical or play. BMD includes specifically tailored content that aligns with each required scene. Base licensing ranges from $250 to $995, depending on product options and performance criteria. How can I view the BMD for Beauty and the Beast Jr. version? @ajhoward01 @APSMaplePride @PrincipalJacobs Break a leg! !